Chicago police fired on a stolen Jeep after its driver rammed the officers' car in the Albany Park neighborhood on Thursday afternoon, according to police records and sources. The stolen vehicle had been taken about 10 minutes earlier when its owner left the car running in the North Center neighborhood while she conducted business at a UPS Store. No one was seriously injured. Patrol officers were flagged down by the woman in the 4000 block of North Lincoln around 3:40 p.m. after she emerged from the package store and found her gray Jeep Grand Cherokee missing. The woman had possession of the SUV’s key fob, but the vehicle had been left running and unattended, according to a police source. 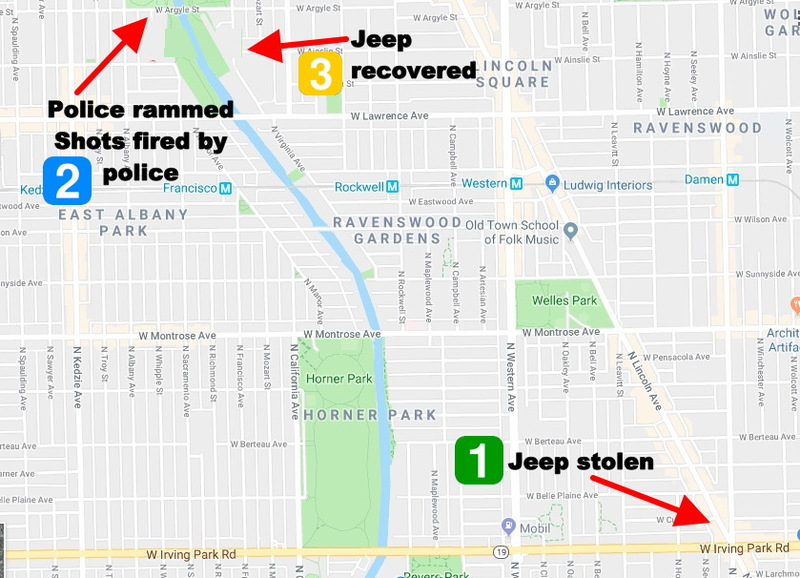 The woman’s husband was able to track the stolen Jeep and relay its location to police officers who soon found it in the Albany Park neighborhood. When two officers emerged from their car to approach the stolen vehicle at Whipple and Argyle, the Jeep’s driver rammed the police car. At least one officer fired at the driver, breaking the car's rear window, before the SUV fled the scene. One officer received minor injuries in the crash. Minutes later, other officers located the stolen Jeep abandoned near Ainslie and Francisco in the Lincoln Square neighborhood, according to local residents. While searching for the driver and his passenger, police found a gray hoodie discarded in an alley near the stolen car. Inside the jacket, officers found identification belonging to a man who has an extradition warrant for robbery. The photo on the ID closely resembles images of one of the men who was later seen on video running from the stolen Jeep, according to an officer who was on-scene. An extensive police and canine search of the area, including the nearby Chicago River, came up empty. • A slender black male wearing a baseball hat, black tee shirt, blue jeans, who had a gray hoodie around his waist. He was last seen walking westbound on Lawrence from Francisco around 4:01 p.m., according to videos. • The man whose ID and hoodie is believed to have been recovered is a black male who was wearing a black tee shirt with a large logo on the front and gray pants or jogging pants. He had a backpack and was reportedly last seen walking southbound on Francisco and then westbound on Lawrence around 4:02 p.m.